»Personality: Due to being at the top so long, you’d think he’d carry himself with a respect others don’t. He doesn’t. There’s a reason for this. He’s never thought himself any better then others, in reality.Sure, they respect him as he's the first captain, but that wasn’t because he was cruel. It was because he made sure the people who stuck with knew him knew that he was like him. He wasn’t this being above them, no, Captain Commander was just a title. He didn’t demand respect due to the title he had, he demanded respect because he deserved respect. Take all this in mind, and then there’s him around kids. He, due to being a king, was taught to teach kids respect and rules, which he did quite well. He is a bit stern around kids but it’s obvious that he cares. He cares more about kids then adults, as he’s fully willing to jump in front of a large group of men just to save one small child, it’s also what earned him respect. The reason why he’s willing to jump in front? He knows they are the future. Albeit, he can be a bit of a hot-head sometimes. »Likes: He loves to smoke... cause it's an addiction. He loves to fight, as to keep up moral and otherwise keep up his own skill. He likes to dance; it's just fun. »Dislikes: He dislikes children being hurt, as they usually can't defend themselves. He dislikes romance more often then not, it's a bother. He dislikes humans who think they are godly. »Extra: The black coat he wears instead of the normal Shinigami Garb. 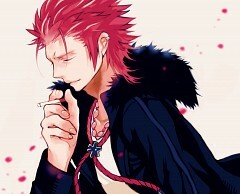 »Appearance Description: Beyond his red hair and his black coat, he has a slouch. This slouch is partly due to him being so tall. This makes him seem shorter then he is, makes him look 6'9. His hair is always spiked, as it is in the picture, as to not get in the way when he's fighting. It's a decent reason, and anything he wears, he wears because it's something that means to him. »Historical Information: He was born to the Lorendo family. The family fell when he was 25. He had a brother, Delvin, he thought he was dead. He thought his brother, who had so much fun with, was dead. He figured he was also dead to his brother, in the most literal sense. 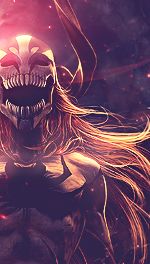 While, to humans, 25 would not be a young age as it is to Shinigami. To Shinigami, to Lucius, it was very early in life, so early that it actually destroyed his self-motivation. This self-motivation came from Devin, a man that found him sad and depressed in the alley way, and what he saw was a tall man who had potentional, rather then a man who was no longer a man. Devin took Lucius, grabbed his shoulder and told him to follow to get strong. Lucius got up that day. Lucius got up and followed Devin who gave him a Bokken, and told him to fight him. Lucius fought and lost, and then got up, and fought again. This happened for 10 years. He and Devin fought over and over, until one day, he won. Lucius was on his back, and Devin could not believe it. Devin got up and fought Lucius and lost again. He could believe it now. He was proud of the boy, no, man named Lucius. The tall man named Lucius was proud of himself for once. The man, 10 years ago, would not have thought that he could beat Devin, but he did. Constant sparring over the next 65 years improved him even more, so much so that he caught a shinigamis eye. The Shinigami, one who was looking through the Rukon he was in, was stepping by when he heard the practicing happen. The Shinigami looked in, and saw a battle between Devin and Lucius, and stopped the two, and asked for a training sword to fight Lucius. Devin nodded, and handed him his, and stepped back. The Shinigami battled Lucius, and could not beat him. Lucius could not beat the Shinigami, but the Shinigami could not beat him. The two fought and fought. It took 30 minutes for the Shinigami to finally beat Lucius, and even then, it was a even contest even to the end. The Shinigami offered to make Lucius into one, and Devin nodded, smiling. He left Devin, and at 100 years old, joined the academy. He got in on his weapon acumen, and he took up smoking around this time. It took him 6 years, 6 long years but he passed the academy and was put into the First Division. He was made fun of, for awhile, as he was tall. He was tall and had red hair. He made a single friend. This friend.. was not actually a new one. Devin had been accepted in as well. Devin was the man who helped him not bother with those who bothered him. Devin allowed him to step up, and fight. He fought for 294 years, he became captain when he was 300, right after his brother had met him again. This was a big thing in his life. He now had his brother, who was trying to rekindle the relationship, and he was all for it. He let his people know he was nothing special, he was like any of them, just with a title that he didn't require you to use, unless you were around him when he was around other captains. He might have Shikai, he might even have bankai, but he was no better then the rest. Other captains were better at some things then him, and he was better at others. You might ask who taught him this, and he'd tell you Devin, who had died around the time he had become captain, but he knew that Devin wouldn't want him to cry, to fall to his knees. He'd want him to get even stronger, even more skilled. That's what he did, that's what he has been doing. He's been getting stronger, more addicted. He became more keen in his strikes and more keen on being grounded, and not at all crawling. He refused to crawl, he'd slouch a bit, sure, but he'd stand tall when he needed to. He wouldn't stand for people making fun of people for how tall they were, or anything like that. 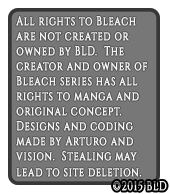 He once even fought a arrancar and killed it. He knew why, though. The thing had greed that all had, but it was extreme. It was so extreme he had to kill it to put it out of it's misery, it's sadness. It said it was happy, but he knew it was otherwise. The thing was sad and greedy. He didn't want to kill it; honest, but he knew he couldn't let it live without it suffering. It was something he's not proud of, but in his long time of being a captain, he's learned that humility is much better then what people like to think is strong, that people think bragging is needed. In his typical layered wear, Mushi was standing. Standing in the middle of a training area; alone as typically was true. He decided, since he was going to meet his team; he figured he should take off his layered wear. He started my taking off his sun-glasses, and putting them to the side. First off, the black coat; which was over the stripped shirt that he often wore. He'd keep on his bottom half though, no need for that to come off. After throwing his wear to the side, he picked up his sunglasses, which hid his red eyes from view, and it blocked the sun out. He stood, as regally as one can in the middle of an training arena, and thought about the members he was assigned. He couldn't tell exactly why he was assigned them, but he took it as well as any 'god' would, and decided to see just what these mongrels; these curs could be. If they were anything like half of the village, he had a feeling that he should have no real issue fighting them; although they will be nothing near the level of his brother. No one could be, really; as high as he held his brother. It was an impossible standard; to be caring of him, yet be strong and firm. He couldn't see anyone keeping to that; especially for as long as his brother did. He also figured, since he was told a bit about the genin, he should exploit that knowledge. That he did. He researched the boys clan; scorch release. It was an interesting thing, although it won't do anything if they can't keep up with him, honestly. These mongrels had as much of a chance at beating him as did any genin; which wasn't high. Although, one must figure that's the cost of being a god. The pure arrogance that comes with it. He had become accustom to it, and it was a part of him like the adoration of his brother; one without the other wouldn't be Mushi, not at all. Could he survive with one half but not the other? Sure; he could. In fact, it really wouldn't be that hard; to be without the god complex would benifit him, but without his brotherly adoration, he'd have no real reason to get strong. It was a double-edged sword, really. Yet, he couldn't be bothered with showing any of that. Although he was in deep thought, he had himself in a high guard, just in case his friends decided to attack him. Well, he didn't think them as friends, but; that was beyond the fact. What he thought of them mattered not, what really mattered was their skill in combat, which he hoped they weren't lacking. If they were, it wouldn't end well, probably a few broken bones and maybe a broken rib. He honestly couldn't be bothered with bringing the petty mortals; the weaklings to the medical center. It wasn't like he didn't know how to set an arm or anything; it was fairly basic knowledge, he just didn't know or have the capability to learn medical ninjutsu. It was a bother to him, really. He had the training zone cleared for him, meaning it was only a sand floor with the walls around the training area. There wasn't going to be any real... fancy training really, there was no need. Old-fashioned punching and kicking would teach them just as well as punching and kicking a dummy. Not to say it wasn't effective, but he figured actual combat would benefit them that much more. They were ninja after all; even if he were a god among men. He hated one thing though; something that was always there but never left. He disliked the fact that his brother just died like that. With no rhyme or reason. He hated it because it felt off, even to him. Even to the god himself, the death of the only equal seemed off. He couldn't be dead, could he? A man as strong as a god; murdered. Just like that? It couldn't be. Honestly; even Mushi knew that. Mushi might be fairly smart and versed on a fair amount of things, but this was beyond him, one day he'd examine, he'd find out what happened, but that day was not today. Today was simply to meet his team; and possibly train them. He had to meet them and tell them his name. It was a simple process for a god like him; even for simple people, it was a simple thing. Although, it still held something to him; this was him taking a responsibly. Something his parents rarely trusted him with; yet the village trusted him with the lives of two people who couldn't be that much younger then him. His face made a visible change as he though this; his mouth shifting slightly to the side. As well as thoughout all this; his eyes were closed under some sunglasses; although he was still on high alert; nothing would hurt him if he could do this; right? Although, beyond the mouth shift, his arms stayed on his sides; and his legs stayed elegant. He wouldn't let people see inside the god; the man who ran the god. Although, he had to admit. His hair was quite fantastic; and clean, for living in a desert. His mind, although full of thoughts, was quite clean. He wasn't ready to call out to those curs yet, it wasn't time to meet. He had come roughly 50 minutes early to think. A hard bout of thought, sure, but still to think. He decided to call out; it was about time those curs got here. "Where are you, Curs, it's time you got here so that we can get training!" He said it loud, as to notify them if they were anywhere near in the premises. Which he would hope they were, cause if they weren't they were taking a damn long time. They were taking Mushis time and that wasn't at all acceptable; to Mushi at least, not that many others cared. He did, and he cared a damn lot. If they were late, he'd yell at them until the sun shined no more; well, at least call then mongrels and curs until he got tired and then punched them. Either worked. Changed, modified history and name.